The Bantam cover of Crime and Punishment (complete with Dostoevsky portrait). The Novel: Is it the tale or he who tells it? That question has been asked a lot over the years. I am more inclined to say that is he who tells it. So many tales can be so similar, but it is what can be done with it that really matters. Let’s look here at Crime and Punishment (really one of the great titles of all-time – mostly because so much of the punishment deals with what is so brilliant in Dostoevsky’s tale – the in-depth psychological study of his great character Raskolnikov). Dostoevsky is probably not the first person to deal with this subject – the idea of the man who believed he was above punishment and could do something and get away with it and deserve to get away with it. But it is the depth of narrative that be brings to the novel, not only for how much he dives into the psychology of his main character (an entire generation before Freud, James and Jung would bring make a new science out of it), but for the intricate way he looks his life and the world around him. But then, even aside from all of that, there is what he manages to do with the story. In the first part of the novel, we see Raskolnikov planning and then executing a horrifying murder (which then turns into a double murder). We watch as he believes that he is superior enough to get away with this crime. But, in spite of that, in Dostoevsky’s descriptions and narrative, we find ourselves looking on this character with sympathy. When we read sentences like “Almost all the while he was reading, from the very beginning of the letter, Raskolnikov’s face was wet with tears; but when he finished, it was pale, twisted convulsively, and a heavy, bilious, spiteful smile wandered over his lips.” or “Having said this, he suddenly became confused and turned pale: again that terrible recent feeling passed like a deathly chill over his soul; again it suddenly became perfectly plain and clear to him that he had just uttered a terrible lie, that not only would he never have the chance to talk all he wanted, but that it was no longer possible for him to talk at all, with anyone, about anything, ever.” we are reminded of the human face of our protagonist and against all odds we find ourselves maybe hoping that he does get away with this brutal crime. And so, in the course of the novel, it becomes our crime, and the revulsion we feel becomes our punishment as much as the guilt is Raskolnikov’s punishment long before he ever makes the trek to Siberia. note: As ever, with the Russian novels, the quotes are all taken from the Pevear / Volokhonsky translation. There have been an incredible number of film versions of Crime and Punishment. They began as early as 1913 and run all the way through to this year. They include a Hollywood version with European talent, and, of course, a Russian version from that period where the Russian film industry made versions of most of the great Russian novels. But, in spite of strengths in the films, there has never really been a fully satisfactory film version (a common theme here on up – of the top 11 novels, unless you count Apocalypse Now, only one of them has had a really satisfying film adaptation). That they didn’t even use Lorre in the poster sums up some of the problems. This was Hollywood’s first attempt at doing Dostoevsky and I would say it comes off about as well as you would expect Hollywood to do, but it lucks out and actually does a little better. Not as an adaptation of the novel, because as an adaptation this is flimsy at best. Von Sternberg himself apparently mentioned in his autobiography that it had little to do with the novel. From the start, they want to go about things the Hollywood way. So they go about introducing Raskolnikov and giving us background on him. So we know of his interests and his student days and his sister before we ever see him in poverty, facing the psychological desperation that brings about the murder that really gets the action rolling. In fact, even though the film is only 84 minutes long, it takes 21 minutes before actually get to the murder. So with all of these things piling up against the film as an adaptation, what is it that manages to save it as a film? Well, there is Von Sternberg, who, while not as great as some critics would have you believe, was always a good director and knew how to shoot a film (the dark interiors and cinematography are perfect for the film – this film wouldn’t get the lush color Hollywood treatment later lavished on The Brothers Karamazov and War and Peace and shouldn’t – it looks better in black-and-white). But there is one other thing here: Peter Lorre. Peter Lorre is one of the greatest character actors in film history. In so many films, from M to The Secret Agent to The Maltese Falcon to Casablanca to Casbah to Beat the Devil, he made things more interesting every time he came on screen. He is, in some ways, perfect for the character – he was born looking guilty (that only seems to carry over from his biggest film role at the time – the child killer in M that made him an international star). He is perfectly wound up to feel the horrible guilt over what he has done and eventually break down, just as he did in M. But, in some ways, that also hurts the film as an adaptation of the novel. Lorre is so odd and suspicious-looking. How could you not immediately suspect him of the murder? How could you even think for a minute that he might not be guilty? That isn’t really what Raskolnikov looks like (“Incidentally, he was remarkably good-looking, taller than average, slender and trim, with beautiful dark eyes and dark blond hair” – almost a perfect description of what Lorre is not). So what makes it weaker as a version of the book also manages to make it stronger as a film, for what kind of good-looking Hollywood star could have given the depths of psychological suffering that Lorre did. Then there is the other problem with the film. If you look at the poster, you can see Edward Arnold built up as the main character. He is the detective, and he is okay in the role. But the role is over-utilized. They needed to focus more on Lorre (especially in such a short adaptation) and given less time to Arnold. This isn’t really a who-done-it. It’s about the psychology of what he did and why. So the detective, while an important role, isn’t really the major one and it’s typical Hollywood to build up their bigger star. It’s good to have different “authoritative” sources out there. Let’s look at Wikipedia. On the page for Crime and Punishment, under film versions, you will find no mention of this adaptation. Look at George Hamilton’s page and it will be like this film doesn’t exist, even though it earned Hamilton a BAFTA nomination for Best Foreign Actor (with good competition – three of the other nominees were nominated for the Oscar). You can find information on it on the IMDb, but there’s not a ton there either – only two external reviews and only 66 votes. And for a long time, it was near impossible to find. But now, thanks to the Warner Archives, and thanks to TCM, I have seen it and so can you. The next question is whether or not you would want to see it. Well, for a low-budget adaptation of Dostoevsky, one that runs only 96 minutes, that stars a man who was never thought of particularly much as an actor, and which moves the action from St. Petersburg to L.A., this is much better than you would expect. 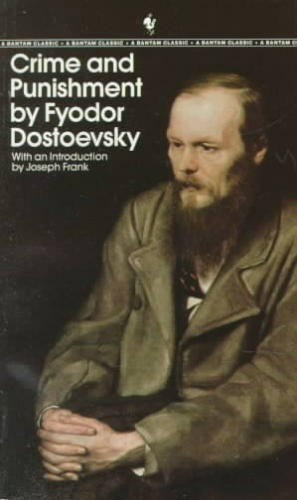 But part of the expectation is to move slightly away from Dostoevsky. Not in terms of plot; everything you would expect to find in the plot is here in the film – the initial crime (the film actually begins with the discovery of the crime), the feverish state, the subplot involving his sister, the continuing presence of the detective, the final confession (which actually we don’t see – the film, rather wisely, ends with him walking up to the detective, but we know what is coming). No, where we depart from Dostoevsky is in the performance by George Hamilton. The character of Raskalnikov is so much deeper, so dark and disturbed, exactly the type of person you would expect to have been played by Peter Lorre. And that would have worked well if say, Tony Perkins, had played him. But, no matter how much Hamilton looks like Perkins in the poster, that’s not the type of performance that we get here. That’s not a denigration of Hamilton’s acting. For those who first learned of him from reading Doonesbury and knew him for being tan before we knew him for anything else, it was always a little hard to take him seriously as an actor, especially after films like Love at First Bite and Zorro the Gay Blade. But Hamilton actually could act – he wasn’t just a Warren Beatty look-alike (which is kind of silly to think anyway, since this pre-dates Beatty as a film actor). It’s just that Hamilton is a different type of actor than Tony Perkins. What we get here is less the deeper, darker version we might expect. Instead, it is more reminiscent of Rope, of the ambitious arrogance of Farley Granger, the kind of man who kills not because he believes he is doing the world a favor, but because he believes he is important enough to decide who should live or die and because he thinks he’s smart enough to get away with it. It’s a bit less Dostoevsky and a bit more Nietzsche. It’s the arrogance of youth. As for the film itself, for a very low-budget film it’s actually pretty solid, expect for an over-bearing jazz score. It’s decently shot, thoughtfully put together and moves well. Outside of Hamilton, the acting isn’t particularly good (though John Harding as his sister’s suitor is suitably creepy), but Hamilton holds everything together. Actually, when you think about it, for a fairly short film, made with little budget, out of a brilliant Russian novel, this is actually fairly impressive, and it certainly doesn’t deserve to have been as overlooked or maligned as it has been. In the late 60’s, the Russian film industry decided to start tackling the best of the Russian novels. They produced what is by far the best version of War and Peace, as well as good versions of The Brothers Karamazov and Anna Karenina – all of them in color, all of them nice to look at and with strong acting. 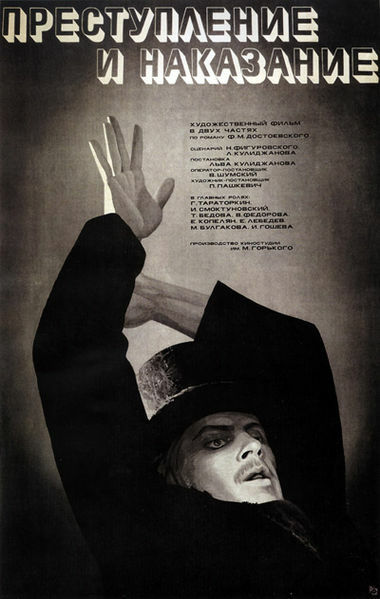 Then came Crime and Punishment, and while it still had the nice acting, it seemed to go out of the way to show that it wasn’t a Hollywood type costume drama. It was bleak, it was dank, it was dark, it was in black-and-white, and it lacked any of the gorgeous period trappings of the other films. This is by far the longest of the versions (220 min), and the darkest. It is, in some ways, also the most true to Dostoevsky’s vision of Raskolnikov. Georgi Taratarkin, not the most prolific of Russian actors, is very well-cast. He has all of the Lorre darkness and paranoia, but he is also handsome and hypnotizing. He is the kind of person you might believe would do something so drastic, but also believe that there is method under that layer of madness. He has the method more than Lorre and the madness much more so than Hamilton. The film itself is a perfectly fine adaptation of the novel. It stays close to the book and never lets up on the dark despair that is present throughout the novel. Unfortunately, while that is part of what makes the novel so brilliant, it wears you down over the course of the film. This is one time where a bit of trimming would actually help, to ease up on things. There is only so much darkness we can take on screen and by the time this one is done, we feel beaten down. As an adaptation of the novel, it is the best. As a film, it leaves you in some ways wanting a bit less. But it’s definitely worth watching for Taratarkin’s rather hypnotic performance. I really love the poster for the 1970 version. And honestly, for a film of its length, I think it moves by quite briskly, too. It does have some odd plot gaps–Raskolnikov speaking to Katerina Ivanovna as if they know each other when their initial meeting isn’t actually shown–but I fully agree that Taratarkin is great, and Innokenty Smoktunovsky is a very fine Porfiry–having the “almost womanish” nature of the character in the book. Have you seen the other 1935 version, made in France? Harry Baur apparently makes a fantastic Porfiry; beyond that I know fairly little of that version. Oh, and it’s a great book, too. If anything, Sternberg is greater than he’s given credit for. 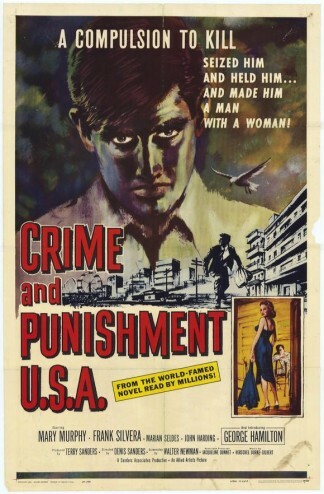 Just found your website in a search for CRIME AND PUNISHMENT USA, the 1959 film with George Hamilton, and would love to hear your comments on the strange 1990’s Russian-Israeli adaptation directed by Menahem Golan and starring Crispin Glover as Raskolnikov. I don’t think it’s available in NTSC format, but I saw a European budget-PAL copy many years ago and though it’s easy to find flaws in, Glover’s performance is something that has stayed with me over the years.